New Ferrari Enzo due in 2013 | What Car? Ferrari has given strong hints that its new Enzo-replacing supercar will be a V12 turbocharged hybrid. Speaking to What Car? 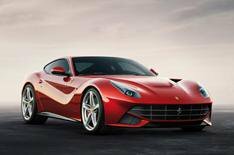 at the Bejing motorshow, Ferrari boss Amadeo Felisa admitted the companys latest hybrid system would be used on a special car, because the cost would be prohibitive on its regular line up of V12 and V8-engined sports cars. He said We have to prepare for hybridisation. It is essential to reduce emissions. Felisa hinted that the new Enzos V12 turbo engine would have at least 700bhp, going through a double-clutch manual gearbox. Electric assistance should reduce the 0-125mph acceleration time by 10% over a conventional powertrain. Hybrid power reduces a Monza circuit lap time by 3%, he admitted, while CO2 emissions would be cut by 40%. Felisa admitted that the hybrid system would add extra weight, but claimed that it would not affect the weight distribution of the new car. It is likely to have a carbonfibre body and chassis to considerably reduce its mass. Also helping to improve emissions is a new cylinder deactivation system , which means that the new car could runs on six cylinders only at low speeds and throttle loads. It could also run exclusively on electric power at parking speeds, and theres the possibility of drivers being able to deliver an F1-style electric power boost when required for extra acceleration. Theres no word yet on when this car will go on sale but its likely to be next year and, like the Enzo, only a few hundred will be made.